In the first introductory chapter the report focus on origin, objective, methodology, limitation of the report and reason for choosing DBBL and preparing report on performance evaluation of the bank. The Product details, Pricing, Distribution and Promotion of the DBBL Card Product is stated the main part of the report. And the last chapter is mentioning the recommendation and the conclusion of the report. All the discussions are presented in detail in the project part of the report. Hope it will help the reader to have a distinct picture of the whole project work. Any kind of criticism is welcome for the betterment of the project. Banking sector in Bangladesh is very competitive, promising and prospective sector. The growth rate of this sector is very lucrative. As a result, to sustain in this sector every bank is to offer and provide unique product to their customer. Not only have the unique of the product, the product has to have appropriate promotion, adequate distribution and accurate pricing. Otherwise, the entire marketing strategy will be collapsed. Dutch-Bangla Bank Limited aims at excellence and is committed to explore a new horizon of banking and provide a wide range of quality products and services comparable with those available with any modern bank in the world. Dutch-Bangla Bank Limited using market follower strategies seek stable market shares and profits by following competitors’ product offers, prices and marketing programs. 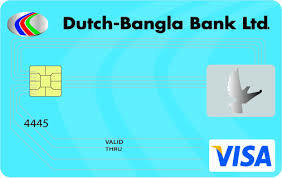 The best product Dutch-Bangla Bank is the DBBL Card Products. A debit card (also known as a bank card or check card) is a plastic card that provides an alternative payment method to cash when making purchases. Functionally, it can be called an electronic check, as the funds are withdrawn directly from either the bank account, or from the remaining balance on the card. In some cases, the cards are designed exclusively for use on the Internet, and so there is no physical card. The use of debit cards has become widespread in many countries and has overtaken the check, and in some instances cash transactions by volume. Like credit cards, debit cards are used widely for telephone and Internet purchases, and unlike credit cards the funds are transferred from the bearer’s bank account instead of having the bearer to pay back on a later date. Debit cards can also allow for instant withdrawal of cash, acting as the ATM card for withdrawing cash and as a cheque guarantee card. Merchants can also offer “cashback”/”cashout” facilities to customers, where a customer can withdraw cash along with their purchase. DBBL is the market leader in Debit Cards. All DBBL debit cards gives you unlimited and free access to all DBBL ATMs and POS nationwide. There are no transaction or hidden costs associated with DBBL cards and accounts. By default, when opening a DBBL account, all clients will receive the DBBL Nexus Classic card. A debit card is more advanced than a credit card. DBBL Debit cards also have more features than credit cards and are fully recognized by Visa and MasterCard. DBBL Debit cards are also more secure, convenient and cheaper than any credit card or debit card in the market. Debit cards can withdraw money from your account directly while a credit card has to issue a ‘loan’. DBBL debit cards come with the client’s photo printed on it and require a secret PIN verification by the client. A credit card only requires a signature (which can be forged) and no PIN verification for a transaction. That is why, for day-to-day banking, DBBL recommends debit cards. Each card comes with a PIN number, which must be protected at all times by the client. The PIN number is used as a password for withdrawing cash at DBBL ATMs and accessing DBBL banking services. Debit and check cards, as they have become widespread, have revealed numerous advantages and disadvantages to the consumer and retailer alike. A consumer who is not credit worthy and may find it difficult or impossible to obtain a credit card can more easily obtain a debit card, allowing him/her to make plastic transactions. öUse of a debit card is limited to the existing funds in the account to which it is linked (except cases of offline payments), thereby preventing the consumer from racking up debt as a result of its use, or being charged interest, late fees, or fees exclusive to credit cards. For most transactions, a check card can be used to avoid check writing altogether. Check cards debit funds from the user’s account on the spot, thereby finalizing the transaction at the time of purchase, and bypassing the requirement to pay a credit card bill at a later date, or to write an insecure check containing the account holder’s personal information. Like credit cards, debit cards are accepted by merchants with less identification and scrutiny than personal checks, thereby making transactions quicker and less intrusive. Unlike personal checks, merchants generally do not believe that a payment via a debit card may be later dishonored. Unlike a credit card, which charges higher fees and interest rates when a cash advance is obtained, a debit card may be used to obtain cash from an ATM or a PIN-based transaction at no extra charge, other than a foreign ATM fee. Banks are now charging over-limit fees or non-sufficient funds fees based upon pre-authorizations, and even attempted but refused transactions by the merchant (some of which may not even be known by the client). Many merchants mistakenly believe that amounts owed can be “taken” from a customer’s account after a debit card (or number) has been presented, without agreement as to date, payee name, amount and currency, thus causing penalty fees for overdrafts, over-the-limit, amounts not available causing further rejections or overdrafts, and rejected transactions by banks. When a purchase is made, the credit card user agrees to pay the card issuer. The cardholder indicates consent to pay by signing a receipt with a record of the card details and indicating the amount to be paid or by entering a personal identification number (PIN). Also, many merchants now accept verbal authorizations via telephone and electronic authorization using the Internet, known as a ‘Card/Cardholder Not Present’ (CNP) transaction. Each month, the credit card user is sent a statement indicating the purchases undertaken with the card, any outstanding fees, and the total amount owed. After receiving the statement, the cardholder may dispute any charges that he or she thinks are incorrect (see Fair Credit Billing Act for details of the US regulations). Otherwise, the cardholder must pay a defined minimum proportion of the bill by a due date, or may choose to pay a higher amount up to the entire amount owed. The credit issuer charges interest on the amount owed if the balance is not paid in full (typically at a much higher rate than most other forms of debt). Some financial institutions can arrange for automatic payments to be deducted from the user’s bank accounts, thus avoiding late payment altogether as long as the cardholder has sufficient funds. DBBL offers the most secure credit card in the market. A credit card offers greater flexibility for international travel in locations, which do not accommodate DBBL Debit Cards. But a credit card is inherently less secure unless it is a Nexus EMV credit card. The reason why DBBL entered the credit card market at such a late stage is because it did not want to compromise your security until DBBL itself implemented Nexus EMV technologies. All credit card DBBL issues are Nexus EMV credit cards. Price is the amount of money charged for a product or service. More broadly, price is the sum of all values that customers give up in order to gain the benefits of having or using a product or service. Historically, price has been the major factor affecting buyer choice. A charge of per card is: 230 Tk. Less: Cost of per card is: 170 Tk. Less: Vat of per card is: 30 Tk. Place includes bank activities that make the product available to target consumers. The concept of distribution channels is not limited to the distribution of tangible products. Producers of services and ideas also face the problem of making their output available to target populations. Since this is a core product, the company adopted mass marketing strategy to make it popular among the existing and potential customers. That’s why this product is available all branches of DBBL in Bangladesh. At present DBBL has 82 branches throughout the country. DBBL has introduced a strong distribution channel to make the product available for the customer. DBBL has a marketing team named Assistant Relationship Officer (ARO). If a customer maintains a Bank account, he may enjoy the DBBL card facilities. The ARO introduces the customer to the Bank official in the Branch and help to open a bank account. The Bank forwarded a “Thanks letter” towards the customer address to justify the customer genuineness. The customer comes to the Branch and fills an application form for card product. The Bank official forwarded the duly filled application to the Head Office, Card Division. The Card Division makes the card and forwarded to the Branch and also provides a PIN number. The customer collects the card and PIN no, then he use the card in any ATM booth of DBBL. All braches are always ready to introduce the features of this product and provide service of this product for every category of customers. In future company has planned to open branches in every post office. In that situation company will also boost up service by providing this product in that branch also. Promotion means activities that communicate the merits of the products and persuade target consumers to buy it. Every bank or company wants to see themselves as a star bank or company in their fields. To be a well-reputed bank, it must need to increase consumer and make them profitable. So, it must need to sell their products. If they can’t sell their products then they will be bankrupt. So to sell the products in a good amount it is mandatory to promote the product in a proper way. If a bank can’t promote their products in proper way, they can’t be able to sell their products in consumer market. By promoting the product in a proper way all the customers will be able to know about the product and when they will know about the product, they will buy the product at least for once. Advertising in TV or radio. Dutch-Bangla Bank Limited already achieved good reputation among all the newly flourishing banks. Based on its market conditions it has developed a strategy and stature of its own. The Bank should increase human resources/Man power. regarding providing the Card Products. use ATM Card all over the country. often heavily burdened with work. customers and also keep its existing customer happy. The product should be promoted in new and an innovative ways. The bank should provide sufficient manpower in local Office. To grow the sense of belongingness more or to motivate the employees. The Bank should maintain sufficient fund in ATM booth. The Bank must adopt strict supervision and monitoring.